Reviews for EYES SHUT. DOOR OPEN. ﻿"This well-directed work features some terrific performances by a talented cast. Victor Shopov (Turner), who has played a number of highly confident, wholly unlikable characters quite brilliantly in the past year delivers again. But this time we see his character's swagger dissolve as he crumbles in the face of the tag team beating delivered by both the truth and the looming specter of his father (sometimes quite literally). As Palmer, Michael Underhill absolutely nails the essence of the desperate addict, effortlessly shifting gears from charming snake to little boy seeking approval to unrepentant thief to blame thrower. It is a thoroughly realized performance." "Cassie M. Seinuk is a writer with a passion for connection." 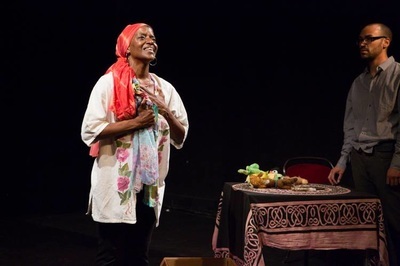 "Now Boston Public Works Theater Company is giving such a connection-one transcending diverse roots and orientation-a powerfully disturbing premiere at the Boston Center for the Arts." "The captives' connection begins with the five-year IDF prisoner showing the young newcomer how to survive confinement-the kind of mentoring that figures prominently in the Frank McGuinness' drama "Someone Who'll Watch over Me." Also, Ilan and Andrew's surreal confinement zone calls to mind Jean Paul Sartre's existential classic "No Exit." "Boston Public Works viscerally probing "From the Deep" more than lives up to that teaching in a must-see premiere." "Understanding that surviving captivity is an enormous mental challenge, Seinuk expands the boundaries beyond four walls to encompass every person's trials with fear, anxiety, and self-criticism, as well as to examine the power of connection in conquering those demons." "At all times, the tedium and the tension inherent in their situation are palpable and we are riveted to the unfolding drama." "...the relationship becomes compelling because of the psychological revelations that the unrealistic setting draws out of these figures." "Perhaps From the Deep should be seen as a postmodern play: it posits two contradictory but equally “real” realities. Still, the performance ends with the stage left empty for a few seconds. The audience remains. The now vacant set perhaps inviting the watchers to experience a moment of catharsis?" "We’re rapt, on the edge of our seats, throughout their terrifying forays into the unknown." “From the Deep,” rising playwright Cassie M. Seinuk’s two-act, two-hour, two-person fictitious play about an Israeli prisoner of war and an American student captive thrown together, packs a potent, emotional punch." "A deeply moving, intense insider’s view of two captives thrown together, marking time and motivating each other." 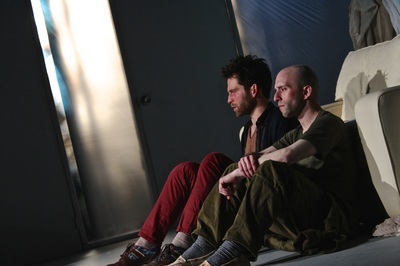 "Seinuk’s fascinating play is loosely based on two authentic young men who went missing." "Besides mounting tension and action, Seinuk employs symbolism and captivating, metaphoric illusion that bolsters the play’s pathos, keeping theatergoers conversing long after the end." "Told through Rosencrantz and Guildenstern Are Dead-like mental challenges and focus games, they work to endure their environment and isolation." "FTD asks its audience to consider the greater human existence through the metaphor of involuntary confinement." "Trigger warnings (The crew really pulled all the stops for this production): FTD is very good and for this reason those with sensitivity to triggers may decide to opt out." "In the words of one distressed audience member, “it’s messed up.”"
"Gilad Shalit story became even more intriguing when watching an interview later. I was preparing a bullet socks and shirts, "Shalit said in that interview," throw all kinds of places, trash, and I'd make up my things and writing things occasionally. Game Location City. "He said he had to hide sometimes the things he wrote for his captors suspected..."
"This week I had a chance to speak with playwright Cassie M. Seinuk about her award-winning play, “From The Deep,” a story inspired by two real missing people from opposite sides of the world and an imagined scenario in which the two could meet and help each other." “It’s tricky,” says Cassie M. Seinuk, whose new play “From the Deep” is being produced by Boston Public Works at the Boston Center for the Arts’ Black Box Theatre through March 28. 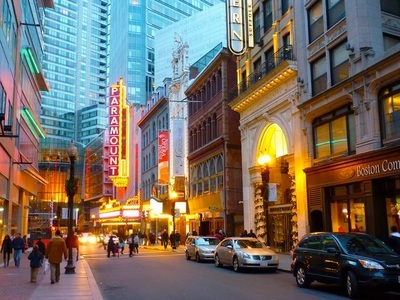 Rather than hand her play over to another company, Seinuk is a member of Boston Public Works, a theater company consisting of playwrights that produce their own work. Although she interviewed other directors, Seinuk says she decided to work with Lindsay Eagle, who had directed earlier iterations of the play. 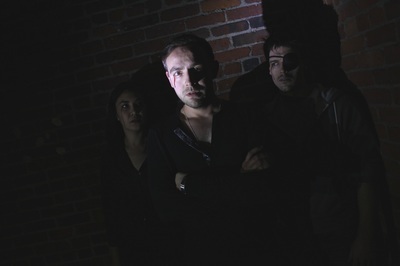 "Boston Public Works’ second offering will be Seinuk’s “From the Deep,” directed by Lindsay Eagle, playing March 12-29 in the Black Box Theatre at the BCA. It takes place in the surreal Room of the Missing, where a vanished Boston college student and an Israeli POW held by Hamas try to help each other survive in their very different states of captivity. "But "Playing Checkers" by Cassie M. Seinuk is the culmination of some of the finest insights this production has to offer. The dialogue is natural and the performances are believable. The audience is carefully seduced into a complex, upsetting and deeply human sexual relationship. There is so much going on in this short play." “Playing Checkers” by Cassie M Seinuk stole the show. This chilling tale about incestuous abuse between a brother and sister was about power: the power we steal in during intimacy. Actors Melissa De Jesus and Chuong Pham were riveting as a brother and sister pushing the boundaries of childhood exploration.